The white label runs through to around RLP 350 (1961) with pressing by the superb DECCA plant (New Malden), or another unbranded subcontractor where the matrix is hand-written. These are all smokin’ pressings. After RLP 350 (1961), UK Riverside shifted all its pressing to Philips, on the Twin Reels / Blue label, though anomalies exist, with the occasional Decca-pressed Blue Label – probably due to a difference between catalogue allocation and actual pressing date. The main differences between Philips pressings is whether they originate from the UK or Dutch plant. About a half of my blue label Philips pressings bear the UK country code 420, the other half the Dutch country code 670, with no obvious pattern by date or artists to explain why the pressing country differs. Based on listening to my 30 or so Riverside releases, UK Decca pressings are among the best I have ever heard, followed by the UK Philips, which are acceptable, followed by the Dutch Philips which tend to sound disappointing and lack the immediacy achieved by Decca or the UK Philips (may depend on title) .The Dutch pressings tend to be lower volume than many others and turning up the volume by 15% can restore the punch. However it does not look as though anyone has a choice. Capacity reasons determined what was done where and you get what you get. Record companies did not recognise differences in pressing quality, though they are self-evident to the fastidious listener with revealing equipment. At least they all sound magnificent compared to what followed. Polydor should not be proud of what followed. Feeble characterless pressings that bears little resemblance to the great music underneath. This stuff emerged from the giant production plants geared to churning out millions of pop records, on wafer-thin wobble-board vinyl. They were not alone. Atlantic and CBS were all heading in the same downward direction, losing the battle. Unusual – first European vintage Riverside I have seen – mono, despite Riverside house colour for stereo being black. Two matrix numbers, local job code, and original source matrix code, neither the catalogue number. I tried following the guidelines you put out here but Im a little confused about if there must exist a Stamped matrix variant of this release, as mine is etched, and if that makes a difference for sound quality. Also: Etched in the black smooth section of the Bill Evans Trio – Sunday at the village vanguard Made in Holland, is as followings. Go to Discogs, search on the artist/ title, go to specific entry for your edition, and see if there are other copies for sale, in similar condition, and what sellers are asking for it. 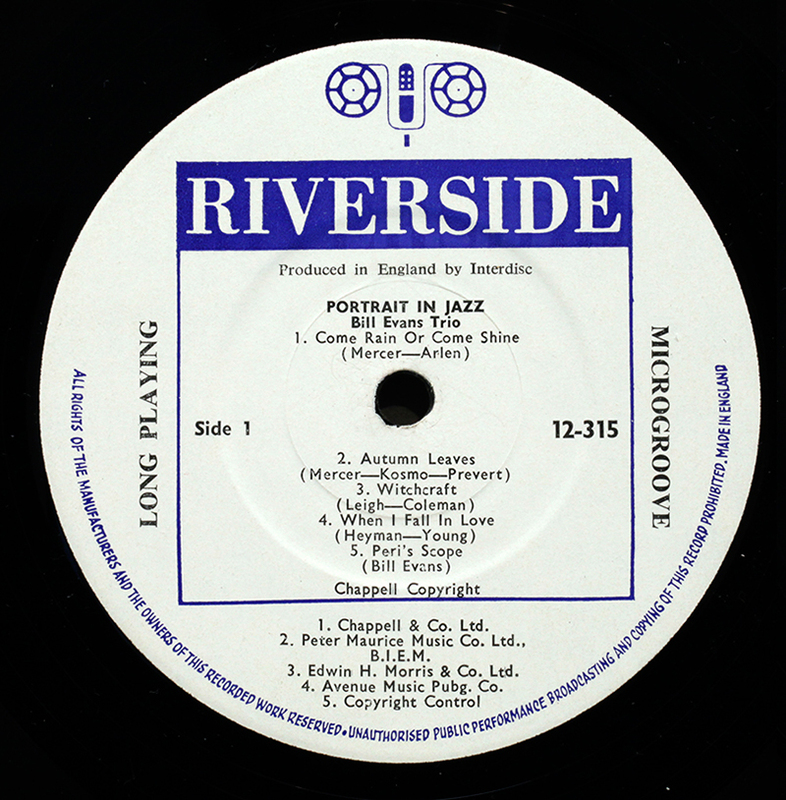 Riverside Interdisc reissues were pressed in both/either UK and Holland for the European market. It is an “overseas reissue under license to Riverside”. The Evans recording will have been re-mastered locally from copy tape, and it is not meaningful to describe it as “first or second pressing” which might apply to the US original releases. Not to say it isn’t a nice pressing, or that it isn’t desirable, or that it isn’t the first European pressing, but overseas pressings do not attract collector sentiment in the same way as US originals, especially in the US market. By my reckoning, these overseas reissues were released around the same time as the original US release, perhaps lagging maybe three to six months behind, I don’t think anyone knows for sure because more copies may have been pressed over time. I would guess late 1961, early 1962. What’s it worth? I’d pitch it at anywhere between £80 and £120, only way to know is to put into auction, and auction results can be unpredictable. Serious bidders draw their own conclusions from research like in the three sources I mentioned. so they will have in mind a “market rate”. After that it depends how badly they want it. I don’t know if you got all the photos for Sunday at the village vanguard, so here they are again, thx Mark. PS: LP info on Miles Davis and Bill Evans. Can’t find a year made on them anywhere. You can not attach photos to a blog-comment: it’s simply a text form. If you want to send photos you need to email them as attachments to my email address in the “Contact LJC” on the banner heading of the site, or upload them to a public photo-sharing site and post the link. There are many nuances in identifying a pressing that are easy with sight of a clear photo of the label and back cover. I have a copy of RLP 242 with hand-etched matrix numbers (RLP…) but there’s a box with MCPS inside at the bottom center of the Riverside box on the labels. Is this from the same era as #1 described above or something else entirely? Mechanical-Copyright Protection Society (MCPS). Royalty collection agency. It was in the 60’s everyone became very aware of the need to assert copyright, and register music publishing business. It is normal around this time. 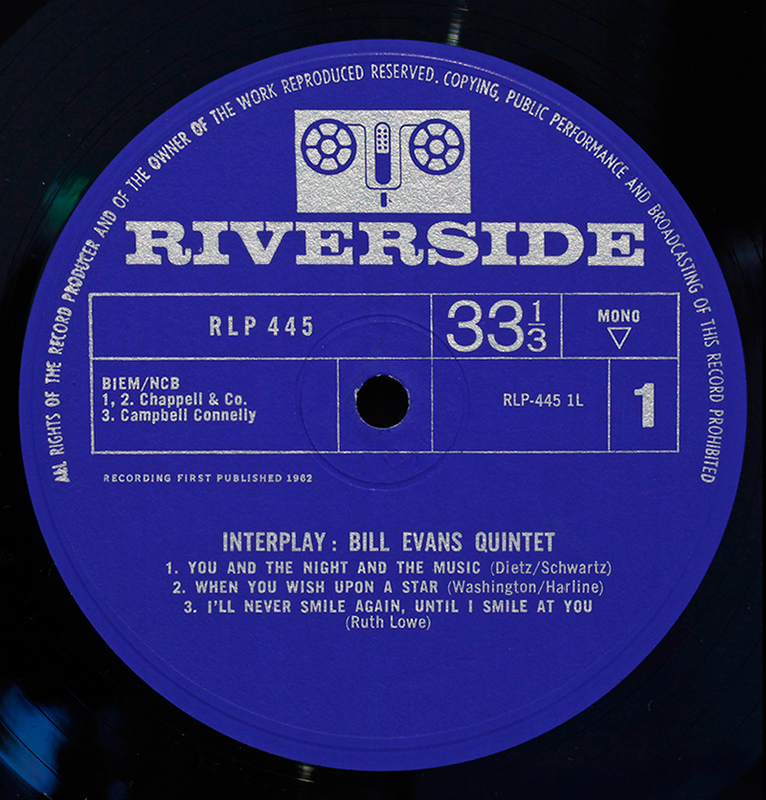 Here the Riverside ABC Polydor are described as bad quality and better avoided, with the label example of Bill Evans’ Moon Beams. It is described as “usual Riverside quality”. I am based in the UK and for my budget the only Bill Evans Trio records I can afford (and find in the UK) are these ABC pressings and the US OJC from the 80s/90s. Hi there, I hope you might be able to advise me? I have of UK original pressing of Portrait in Jazz, vinyl in VG+/Near mint condition (some wear to the cover). Would you have any idea what a fair price would be for me to expect to sell it for? Any guidance would be very much appreciated. Thanks! Can you help me? And the label is white and blue. Oh no! My copy of Cannonball Adderley’s ‘Nippon Soul’ turned out to be a Dutch Philips pressing after consulting your label research (DP sounds like a lesser known gangster from Atlantic City or somewhere, eh!). Didn’t stop me writing about it though. Caveat emptor and I hope for better luck and greater judgement next time. Thanks for your hard work. design. Is this a one-off or were other records in the series mis-labelled in this way? Street on Saturday 28 November 1966, before going on to the JATP concerts at the RFH. I still remember mid-’60’s going into HMV in Oxford Street on a Saturday morning, listening to Hendrix and Cream in the vinyl listening booths, and leaving without buying, my pocket money wouldn’t cover it! I just scored a white label test press in white flip back sleeve of Monk’s Music today, with the hand scrawled matrices in the run out grooves. I thought this might be the place to check this, but as it is not mentioned, I can throw some extra light on these. There is a dishing to the centre of the labels to both sides, and I am familiar with these from my Pye oldies of the same era. Pye were the first people to make a stereo lp for general release (1957 Mindru Katz in the Emperor concerto, if you were wondering), and their vinyl recipe is usually hard, and they play well even when looking battered. As you mention, the sound is a delight to this, played on an Ortofon Mono cart through a valve phono, loving the contrast between Coltrane and Webster here. Hallo from Crouch End Mr LJC! First of all a big thank you for your assiduous research all set out in copy of clarity and wit, and never overlong, and the excellent pictures. 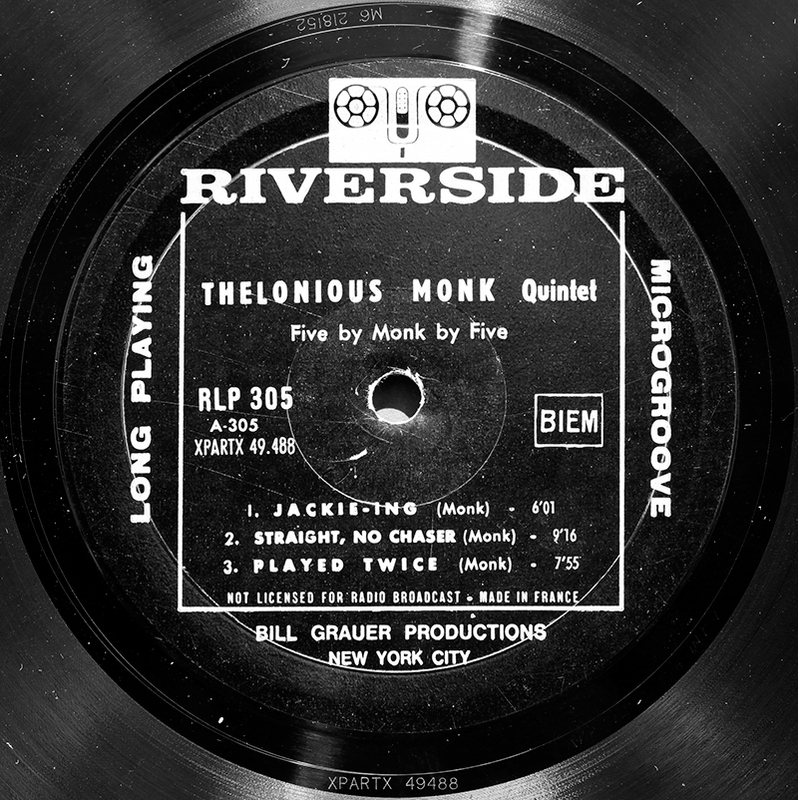 Today bought Thelonius Monk with John Coltrane, JLP 46 on Jazzland, but the label says Riverside, blue, and the code is JLP 46 2L2 //420 [V V] T (the ‘vv’s are slightly raised from the line). Mono with with the mic and twin reels.Doesn’t say ‘Microgroove’. Cost me a tenner. Any idea the date? Hi, what you appear to have is a UK Riverside Interdisk release, pressed in the UK (“420”) by Philips. 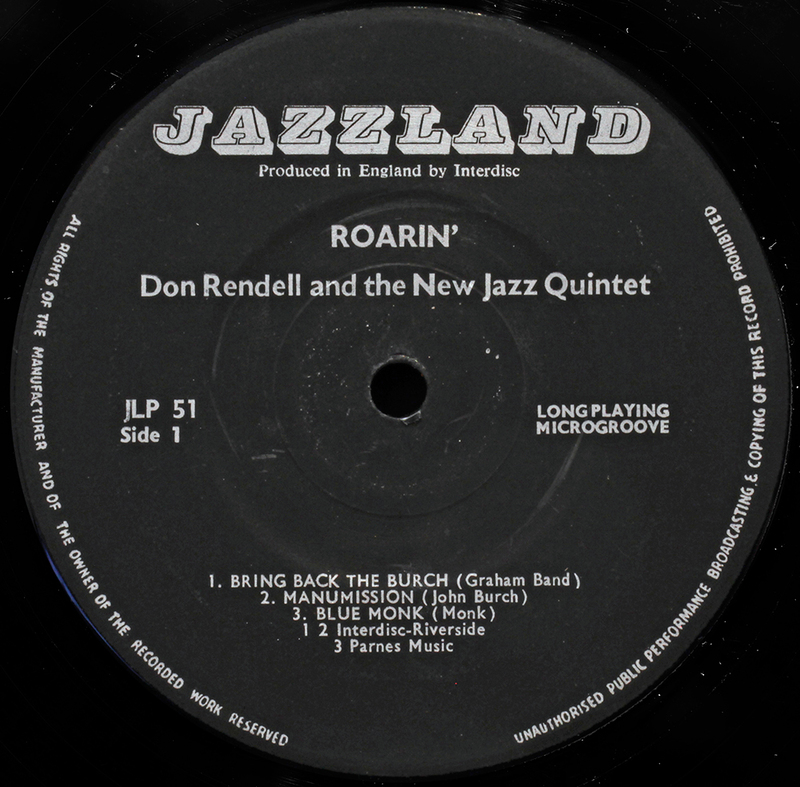 They possibly didn’t have the right label template for Jazzland at the time (though I have seen them on UK pressings) They used Riverside blue twin reels and mic, and retained the JLP catalogue number. Jazzland and Riverside are from the same stable, so its not really material from the rights point of view. The original recording is I believe 1961 (my US copy) – when that UK one was released, possibly same or following year, hard to say for sure as Coltrane’s star was in the ascendant at the time, and further pressings may have been made. You did well on the price, my US copy cost considerably more. Also got Ed Thigpen – Out of The Storm. Had never heard of him – I’m a total non-connoisseur neophyte – which I got because it seemed in good condition, plus Herbie Hancock on piano. 1966. This one I really like. I don’t have the usual vocabulary but basically it’s quite funky, but not funk, reminds me of Jimmy Smith (of whom I have heard only “Best of~”). Quiet atmospheric drum parts (remind me of I don’t know, Brazilian stuff), the Mexican number, and piano and drums seem to be the centrepiece though of course Herbie’s tender caresses sweeten every melody… Howzat for a first ever review? OK I’ll get my coat. You may be interested in the shop, on Tottenham Lane opposite Hornsey Police Station (I hesitate to tell, lest local readers empty the jazz boxes (there are 3) too fast. Please, no buying!) Opened couple of months ago and David the owner clearly has both good contacts, enjoys the music a lot himself, and I beleive reasonably priced. Open Friday Saturday and Sundays. The chaotic catologuing (or, lack of it) does have the benefit of throwing up some interesting LPs you might not usually consider – at least if you have eclectic taste. 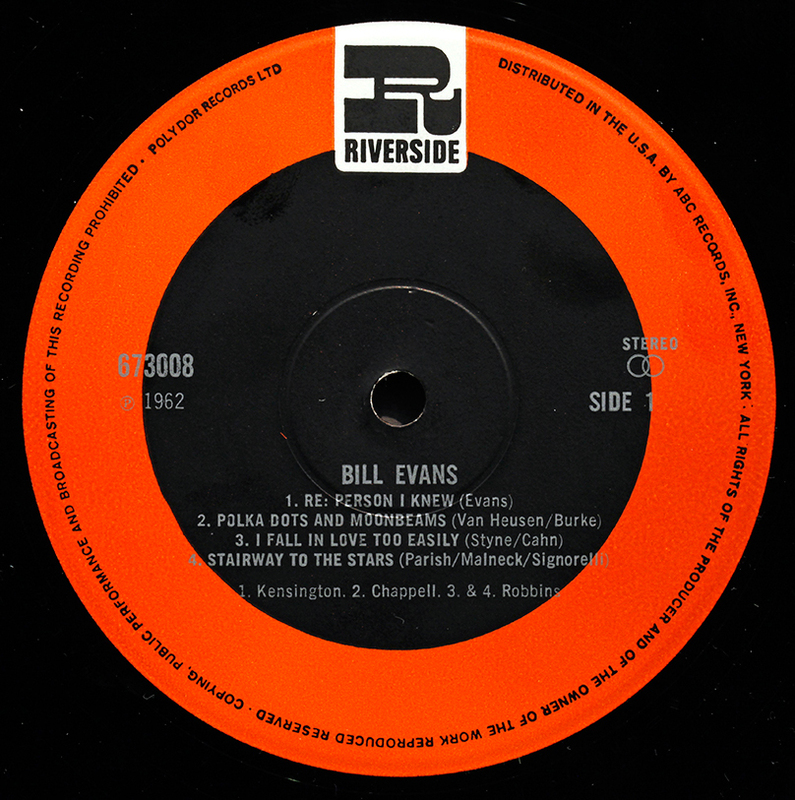 it looks like a legitimate original U.K. Riverside pressing (like the Bill Evans shown hereinabove). If you like this sort of music you should buy it. 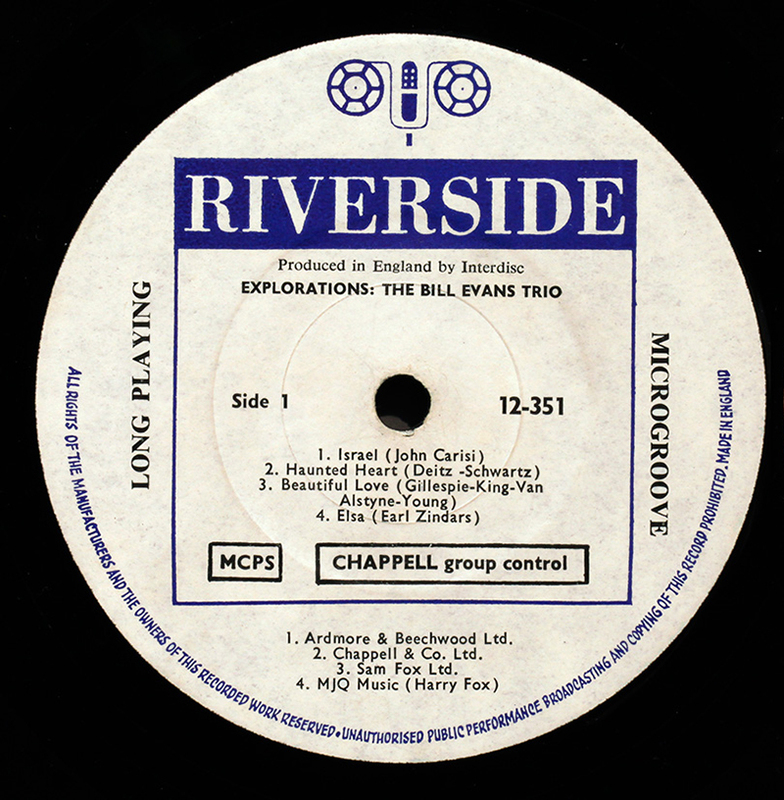 Riverside Interdisc edition Made in England, with catalogue number which indicates pressing by Decca ie the best in UK. US Riverside I have found a very mixed bag, inconsistent quality and not always a “clean” pressing, below par despite being supposedly “original” . One of those labels where I would recommend the UK/Decca pressing over the US orginal. i find the labelography info fascinating, esp. excellent quality pics; bravo!